We R Memory Keepers is thrilled to announce that on Wednesday, May 14th starting at midnight (EST) we will launch the new Evolution Advanced exclusively on the Home Shopping network! 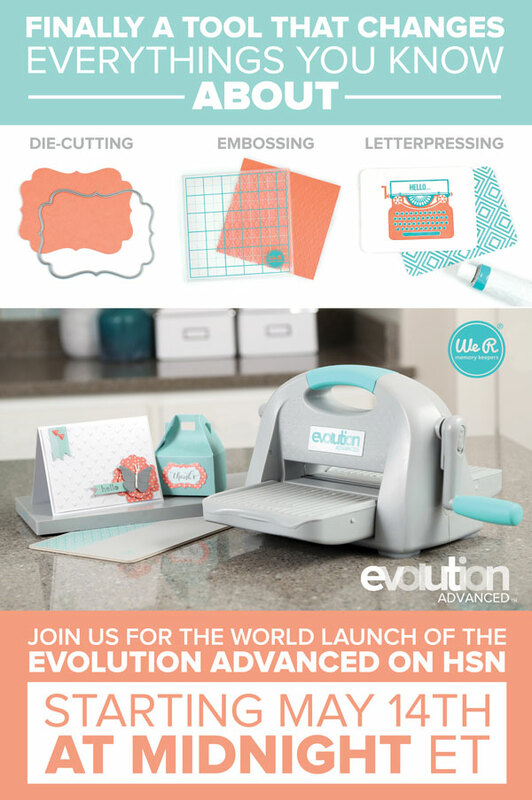 This first-of-its-kind new die-cutting, embossing, and letterpressing tool will be available across all of HSN’s platforms, including TV, online at hsn.com, and via mobile with the HSN app. Come back tomorrow and we’ll highlight some of the exciting one-of-a-kind features of the Evolution Advanced that make this new tool such an exciting breakthrough in the paper craft industry. We’ll also share some project examples of what you can create with this amazing tool. I hope to “see” you then! Hi Ann, I just watched the video and it worked fine for me. It may be the device you’re watching it on. Try using a different device or computer and see if that helps. This is one great all in one tool, love it! Love the letterpress feature because I have none that does that yet, would love to find out more about the product reviews and such. Congrats on the launch of the new product! We are excited for the new launch from our friends from We R Memory Keepers.